Went to art stage with a few AEP-ers! Well, there are too many things to see that we didn't manage to view all the works. ): Art Stage should be held for a longer period of time(Why is it only held for 4 days? 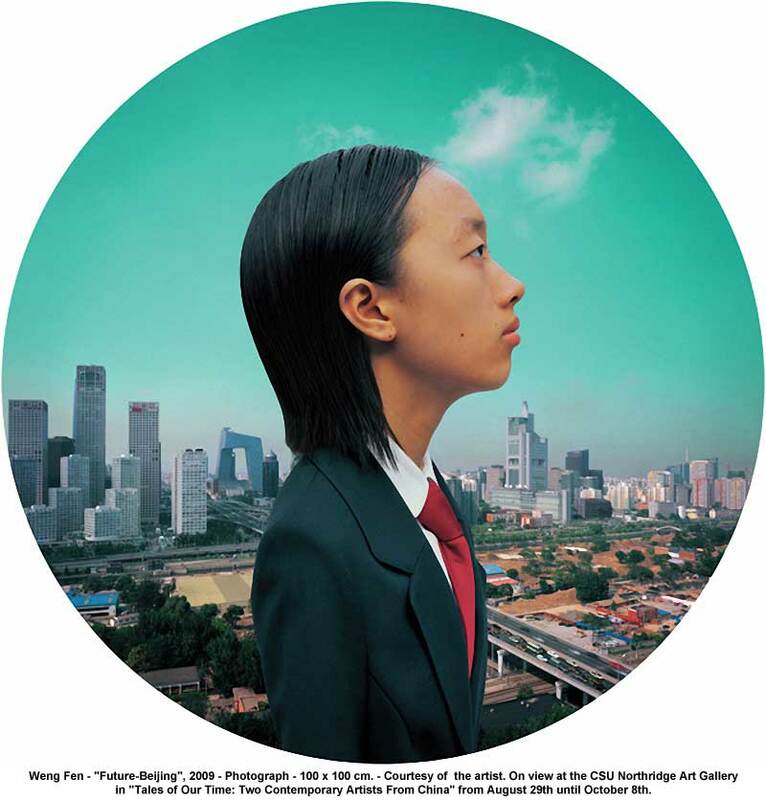 ): )The exhibition totally changed my impression towards contemporary art. Before Art Stage, I thought that contemporary art is mainly nonsensical, but I am glad that Art Stage proved me wrong. I can feel the vibrancy of the works! I have decided to elaborate more on art stage as I felt that this exhibition was the one that sturck me the most. I have went to the Louvre to see the Old Masters' paintings, the Singapore Museum to see the Impressionists', to Berlin to see Dali...and now, I have went to Marina Bay Sands to see Contemporary Art! This exhibition was really different from many of the previous exhibitions that I went to. 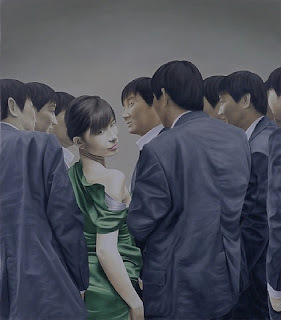 Most exhibitions showcase works from a certain art movement being put together, so the painting style is similar, characteristic and distinctive. Therefore, there was somewhat a lack of variation of art as the works are similar to each other and the medium used is mainly traditional - oil on canvas or pencil sketches. However, at Art Stage, works are generally not related to each other and there was sense of vibrancy and spontaneity in the exhibition. As we walk through each small gallery of the art stage, we encounter different works juxtaposed together and we can be often surprised as we do not know what to expect. There are interactive works, shocking works, beautiful works and so much more. The richness of this exhibition is just...WOW!!! Through art stage, I realised that contemporary art can be presented in many different forms, with many different media. There are many works that have captivated me and I am impressed with the variety of works showcased. The works showcased each artist's creativity, interpretation of issues and the ability to express himself/herself. Well, I only managed to snap a few photos as there is a 'no photography' sign outside. The first part of the post will be filled with pictures that I have managed to snap. The dots are actually 'pop-ups'. Cool textural effect! Simple but interesting! It plays with the application of different colours and CONTRAST. Firstly, the dots and the background contrast in colour, so that the countless dots are noticeable. Secondly, the texture contrasts. The background is flat, 2 dimensional with minimal variation of surface while the spots are spontaneously applied in thick dabs. Well, this is impasto on canvas! Like really thick textural impasto! The dots are all pointed so as to enhance the 3 dimensional quality of the work. The ingenious usage of pins to create the forms of a cherry blossom tree! The use of positive and negative space is important in this work as it emphasises the presence of the tree. There is also a combination of 3-dimensional and two dimensional effects. Well, you have to stand from afar to actually make out that it is a cherry blossom tree. Just like how the different dots of pointilism seem to merge into one complete scene or object when viewed from a distance! The work is simple when viewed as a whole, but detailed when viewed as individual pins coming together. The soft hues(a combination of pale pink and baby blue) in the work add to the lightness and airy feeling of the work. The scale is large, so the work looks more like a cherry blossom tree! Wow at the 3-dimensional double bass! (: Creative use of wire mesh and some other media to create the sense of lightness in the work! (: The double bass is suspended in the air to further emphasise the light weight and airiness of the work! The contour is also really clear and defines the shape of the double bass in a realistic way. (well, it is not distorted).... The artist must have carefully studied the shape of the instrument to achieve such precision! When zoomed in, there are really intricate details! I think that the artist took a long time to plan the details! I feel that the work is 'seen through' so as to show each and every minor detail of the work. To me, the artist is using this to convey to the viewers that the process of art making is actually very tedious and requires a lot of patience and resilience. The process is something that most people tend to overlook and it is something that only the artist can experience. 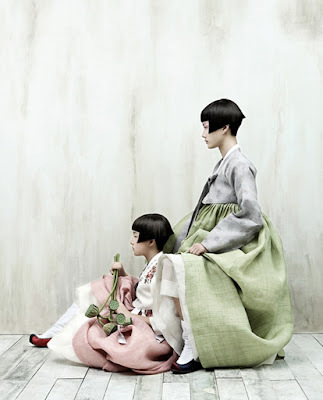 These works are by a Japanese artist - Sakae Ozawa! (: I really like the juxtaposition of forms! (: The composition manipulation is really skillful and the figures are arranged in a somewhat non-realistic way but it is aesthetically pleasing. A little like the Surrealists! (In a cartoonised way) The use of arbitary colours in the second painting balances out the warmth of the painting, adding the tinge of vibrance and liveliness to it. Works 1 and 2 have a soft feeling to it, adding to the fantasy quality of both works. The forms are of a drapery quality, drooping downwards, which guides the viewers' eye movement in a way. Collage style. But too messy for my liking. There are too many things happening at the same time! I feel that there is no focal point so I feel confused, due to the messiness in the work. However, I have to admit that the strong, bold, bright and complementary colours actually attract the viewers' attention. In comparison to the previous work, this has a central focus and there are no 'distractions' in the work. The flower dominates the whole composition and the lines in the work lead to a central focal point. The lines seem to be radiating outwards to form the flower, which reminds me of the stars in Van Gogh's "Starry Starry Night". Complementary colours of red and green are placed together in harmony so as to bring more attention to the focal point. A neat and tidy piece of work. I find that this work is quite traditional and the definitive, realistic, well-blended, smooth brushstrokes are reminscent of the old masters. However, traditional methods of painting are brought to paint contemporary subject matter. The work is photo realistic, except that the eyes are exceptionally large nd exaggerated. The beautiful folds of the red clothing are perfectly captured with tonal variation of the same hue. The first artist that I wanted to introduce in this section is the photographer ANNIE LEIBOVITZ! I really admire her as she is one daring photographer(she is also one of the most famous photographers in America!). I came across her when I was in Sec 1, in Australia. She had an exhibition and her 'advertising' photo was this photo. The grandness and the flowing quality of Nicole Kidman's dress captivated me a lot, so I dragged my parents to the exhibition. She takes magnificant photos and she has also taken some controversial ones. She photographs celebrities, the Queen of England, the US President and her relatives and close friends.This photo was displayed at Art Stage. The enchanting photo of a daring photographer, who knows no limits. This is an interactive installation. It provokes and awakens our senses! We can hear the sound of the crashing mirror. We can see the crack appearing out of nowhere then disappearing again. 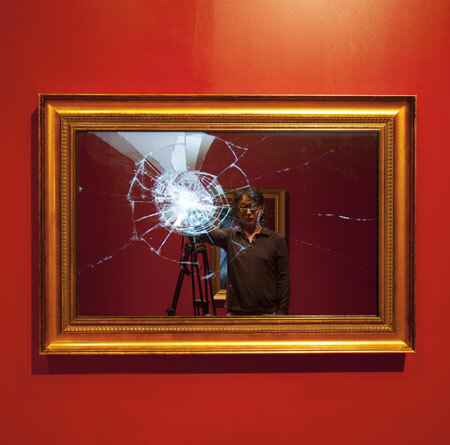 The sound of the mirror being cracked is the thing that brought me to view this work, because I was curious to find out why the cracking sound kept replaying. It is also interactive in such a way that it reflects each viewers who is standing in front of the ework, so the "components" of the artwork changes everytime a viewer comes and goes. It is a very original and unique idea! This artist was featured in the Chinese newspapers about one month ago! According to the title of the article, the artist stated that art practioners should deserve more credit and recognition. I totally agree! I mean being an artist is not a conventional job but I feel that being an artist is actually meaningful. Artists are creators, and their works ensure that the world's creativity does not die down. Anyway, back to the work! The bald men are actually "self portraits" of the artists(he is bald!). I suppose the artist is trying to convey the feelings of frustration towards a certain issue in his work. The dominant figure looks unhappy and his facial expressions are scrunched up. 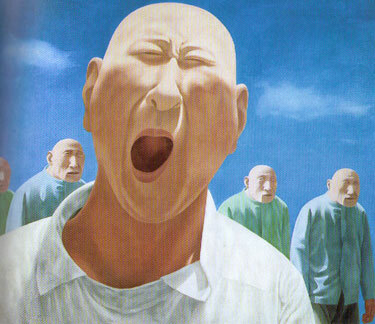 It reminds me of Lang Kacang, as the figures in both works have their mouths wide open. 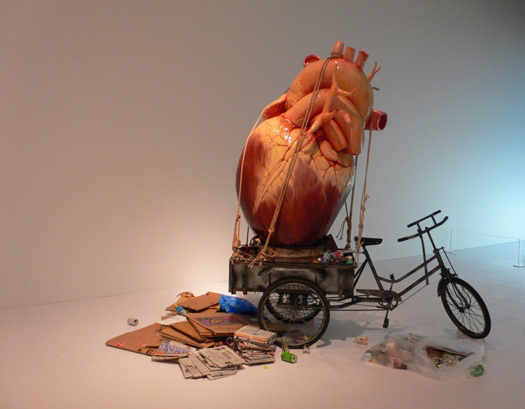 This work is a huge model of the heart! It is like a comination of art and biology, which shows that the arts and the sciences do not have to be mutually exclusive! The size of the heart is humongous!!! It dominated the whole composition such that I never really noticed the rest of the objects until I looked closely at the artwork. Well, I guess that the heart is the highlight of the artwork, just like how our hearts are the "highlights" of our bodies - it is the most important and essential part. I believe that this work is to emphasise the importance of the heart in the human body. However, judging from the title, it is like asking us to "reclaim" our hearts. Maybe the artist is trying to highlight that there has been an increasing number of "heartless" people has our society modernises. There seems to have been a significant loss of heart-to-heart relationships as our society is growing colder. That is why we must "reclaim" our hearts so that warmth and love can continue to exist. As for the bicycle and the newspapers/books, there is a need to "reclaim" them as they are being replaced by cars and electronic reading devices. So I feel that this work is trying to highlight the importance of tradition and reminiscing the past. In my opnion, this work is visually impactful and shocking. 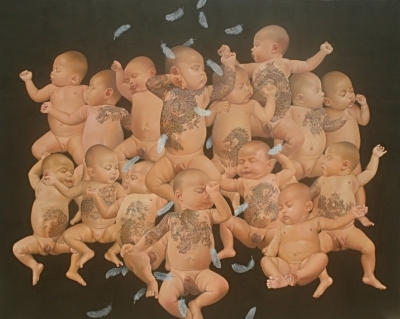 The first question that pops into my mind is: WHY ARE INNOCENT BABIES COVERED WITH CRUDE TATTOOS?!? The last beings to get tattoos would be babies! Is it to show that the world is becoming more and more corrupted such that babies so young seem to have lost their innocence to the world? I really wonder what is the real meaning behing this work...I feel that the issue that the artist is trying to convey is something negative and dark. A picture speaks a thousand words. The detailed criss-cross patterns are similar to a work in the previous part of my post! (Moonlight of Franz Liszt). The "suspension" idea is also similar! 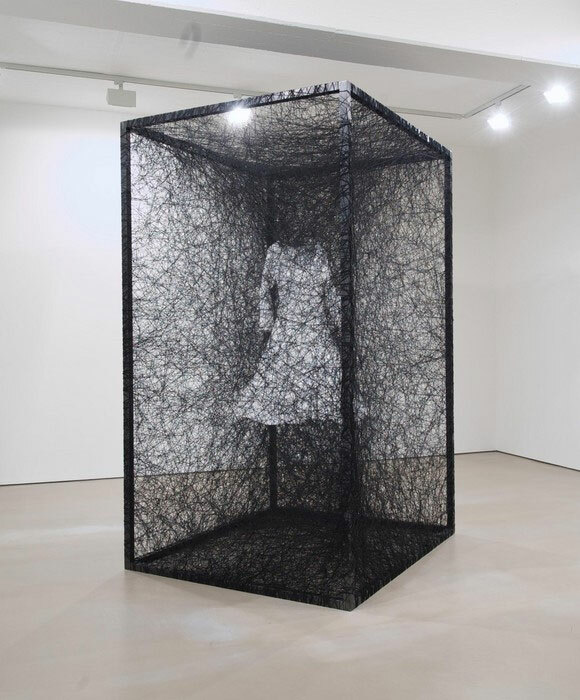 Except that this time, the dress in suspended in the box, and since the box is placed on the ground, it gives a sense of solid and steadiness. This art piece is quite haunting because of the monochromatic colours used - black and white. It suggests creepiness as the white dress is "floating", almost ghost-like. It is a quiet work, one which suggests alienation from the world, enclosed in a box, retreating into one's own small world. A stoic work. Still and Silent. The silent work shall speak for itself. This work reflects a young individual looking forward and pondering what lies for her ahead. Maybe she is thinking about how she can contribute to the Chinese society in the future. China is a economic powerhouse that has slowly matched up to the USA, and this work hints that China is going to develop even further, especially Beijing. This is evident in the tall skyscrapers that are in the background of the work. Maybe the artist is implying that young talent is crucial for the further growth of the country in the future. I got a shock when I first saw this. 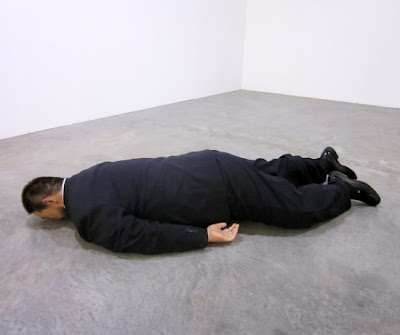 I thought that it was a live performance art and that the artist was planking, without moving. So I asked the person in charge of the gallery whether the person was real. Well, it turned out to be a sculpture! The realistic depiction of the human form is incredible! It looks even more realistic than ancient Greek Sculptures! The proportion was right, there was no exaggeration and the colours used were normal. It was a simple yet detailed artwork, but it was effective as people are drawn to the work subconsciously(ok, at least I was). I admire the skills of the artist - to be able to create a sculpture that is photo realistic! 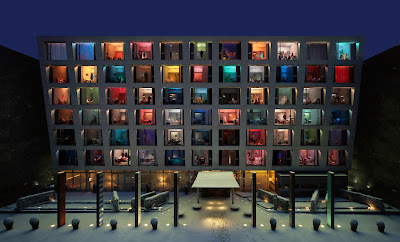 Each "room" shows what people normally do on a Saturday night. 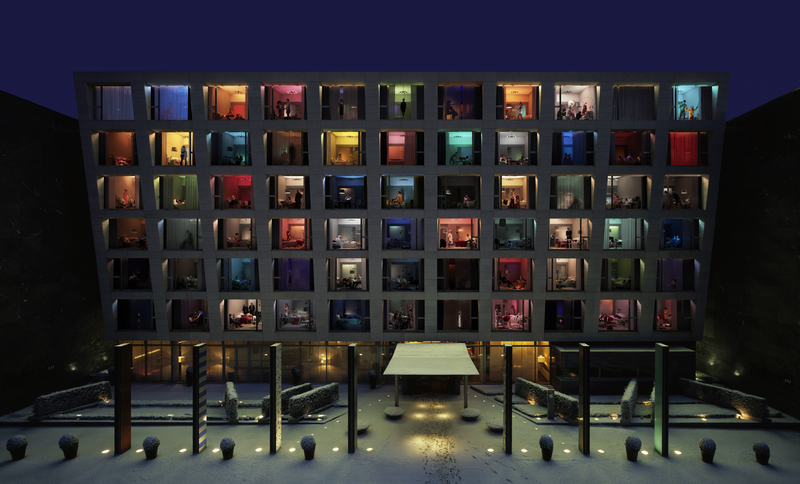 The work is about the size of a wall and it depicts a hotel/building with a glass wall. The rooms are covered by glass so we can all see what is happening inside- most of which is quite suggestive, seductive and subversive. I would classify this piece under controversial art as the subject matter is not what everyone would accept easily. This is a playful art piece, one that suggests humour and fun. The single colour used - red, is a bold, raw, striking, strong and spontaneous colour, suggesting the playfulness of a child. The child's facial expression also conveys the notion of being mischevious. The large scale of the art makes the art dynamic and striking. With the scale and the colour, this art piece stands out from the rest of the works there. The children are also naked, which captures the raw essence of being a child. Here are 2 videos that showcase some of the works that are in art stage. Well, in the videos, we are taken on a mini virtual tour through the exhibition. It shows the rich variety of works and some parts of the videos show how the viewers can interact with the work. Mainly for my own reference in the future, when I come back to relieve my memories of Art Stage 2012. This exhibition had exposed me to the broadness of the modern art world, to unique mediums that I have not came across before(like c-print). The forms of contemporary art are limitless and that is the freedom of art making in the 21st century. The richness and wide range of works in the art world is what makes art even more interesting now. In the past, art is more restricted, so new revolutionary art movements constantly challenge the meaning of art. Now, look at how art has developed into so many different forms! As of today, the art scene is constantly changing and I feel that there is so much space for modern artists to express themselves and inspire others. This means that all of us, as 21st century artists, are able to make art without any restrictions and I am really thankful for that. Imagine living in the Impressionists' period, where only Old Masters' art are accepted into the Salon and how painting in a new style attracts so much criticism. At that time, artists' work so hard to gain recognition and slowly change the not-so-open mindsets of people. Now that people are more open-minded towards different art, we can make art that we like, we can also challenge ourselves to break our boundaries and experiment with new things. Art Stage had been a eye-opening experience for me. I feel that among all of the exhibitions that I have went to, this one was the best! Each work encapsulates the true essence of expression. There works there are all unique and special in their own wa, so different from one another! Some are light, some are dark. Some are multi-coloured, while the others are monochromatic. Some are simplified and abstract, while the others are detailed and realistic. Some are gentle and soft, while the others are controversial and shocking. Some are as small as an A3 size drawing block, while the others are at least 3 metres tall. Some are 2 dimensional, while the others are 3 dimensional and pop-ups. This is a record of my journey as an artist. "Painting is just another way of keeping a diary. " Mark Ryden's only non-morbid painting. Sec 3 EOY - SUCCESS!